Artist Cindy Shanks with Morris Museum trustee Charles Pascarella and his wife Maryann. 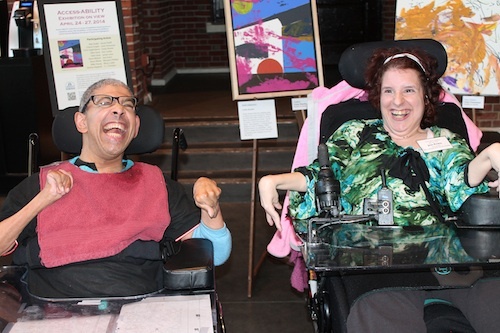 The occasion was the opening reception for “Access-ABILITY,” a series of exhibitions the museum is presenting this year to showcase the expressive creativity of individuals with special needs. 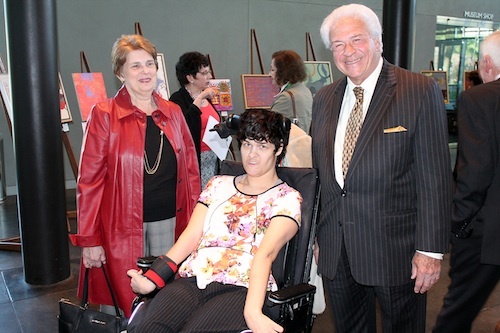 Seven artists from Matheny’s Arts Access Program were at the reception, and 30 pieces of visual art were on display. In addition, those in attendance were treated to readings of original work created by Arts Access writers. Arts Access provides individuals with disabilities the freedom to create in the visual, literary and performing arts. The Arts Access exhibit was presented April 24–27. It will be followed by exhibits by JSDD (Jewish Services for the Developmentally Disabled) WAE (Wellness, Arts & Enrichment) Center Artist Showcase, July 17–20; and ECLC of New Jersey & P.R.I.D.E. (Promoting Responsibility, Independence, Decision-making and Employability) Artist Showcase, October 23–26. Beginning Sunday, May 18, visual art by Arts Access artists will be on display at the Annual Collaborative Art Exhibition New Jersey Medical School — ARTS at Rutgers, The State University of New Jersey in Newark. An opening reception will be held from 2-4 p.m. The exhibit will also include art from three other organizations utilizing the innovative Arts Access methodology: JSDD’s WAE Center in West Orange, NJ; Hattie Larlham Creative Arts Program in Mantua, Ohio; and The Arc Mercer, Inc. in Ewing, NJ. Artists James Lane and Jess Evans. Behind them is an untitled painting by Cindy Shanks. This entry was posted in Uncategorized and tagged Access-ABILITY, Arts Acces Program, Morris Museum. Bookmark the permalink.